According to the dictionary normal means: usual, common, typical, and routine. So if chaos is usual and dealing with it routine, that is your normal. If you don’t like your normal then it’s time to redirect your energy and create a new normal. Racing from one responsibility to another leads to sleep deprivation, poor eating habits, and reactive behavior. This dynamic and life-changing program gives you a step-by-step approach to gaining control over your chaos and creating the life you are longing for. 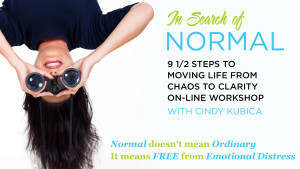 Stress expert and Energy Coach, Cindy Kubica shares how she gained control of her chaos, took personal responsibility for her own happiness, and created the life she truly desired. You can, too! Stop waiting for others to change in order for you to be happy. You only have control over what you do. Start taking care of yourself—without guilt. Allow yourself to feel real joy again. Live the life you truly desire. How to get others to respect your time and make no mean no! Call Cindy today and begin your journey to a New Normal.